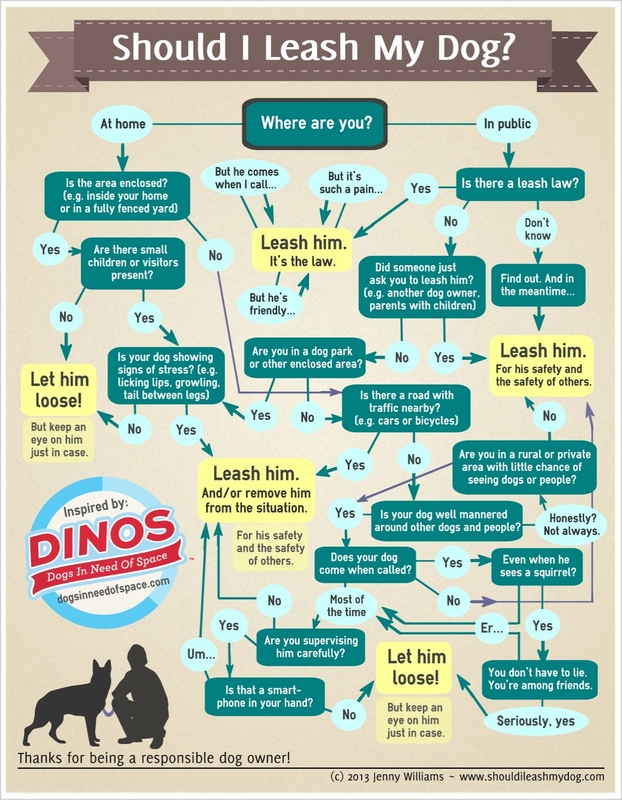 The Flowchart - Should I Leash My Dog? "Should I Leash My Dog?" is a slightly tongue-in-cheek infographic I designed to encourage people to respect leash laws and use good judgment in deciding where and when to leash their dogs. It first appeared in an article by the brilliant Jessica Dolce, founder of DINOS: Dogs In Need of Space (TM) and blogger extraordinaire at Notes From a Dog Walker. If you haven't already, please read Jessica's excellent, thorough post on responsible leashing practices and check out the DINOS Facebook community. The graphic is best viewed at normal page size (US letter or, with a smidgin of creativity, A4). In the meantime, happy dog walking, and I hope you enjoy the chart! Click the image to enlarge, then right-click to download. For printing in black-and-white: try this jpg or this pdf instead. *POSTER VERSION NOW AVAILABLE! * Great for vet waiting rooms, animal shelters, pet stores, dog parks, and the front doors of loose-dog owners everywhere. Thanks to Mirta Jambrovic for the translation! Thanks to Corinne Lee for the translation! Thanks to Sharon Kuipers for the translation! Thanks to Riikka Halmela and Sami Nikkari for the translation! Thanks to Cristina and Aurélien of Tout Pour Mon Chien for the translation! Thanks to Carolin Rother for the translation! Thanks to David Ben-Zur for the translation! Thanks to Agnes Nemeth for the translation! Thanks to Elder Susan Yehee for the translation! Thanks to Cristina Navarro for the translation! Thanks to Sledzikujacy Bern for the translation! Thanks to Roberto Barata for the translation! Should I Leash My Squid? Because we all want to know. * Interested in translating? Let's talk! Please do: Share the graphic on your Facebook wall, on your blog, on your Pinterest board, on Twitter, at your vet's office, in your neighbor's mailbox, with your community, at local animal shelters, at the dog park, at adoption events, and pretty much any situation where you're giving it away for free. That holds true even if you're a business. For example, dog trainers may distribute copies to their clients; shelters and veterinarians may display flyers in their lobby; rescue groups may include the image in their newsletter; and local governments may post it to their website. Yes, some of these things border on the commercial. I'm cool with that. Please do not: Sell this graphic as an individual product or within the context of a larger product (e.g. printing it in a magazine you charge people money for) without ﻿asking﻿ first. Please do: Give full attribution. Please do not: Alter the graphic in any way, such as rewriting the text, replacing any part of the image, or removing the copyright information. Still not sure? Just ask! I'm pretty easy-going, promise.